I’ve made no secret of not fully appreciating the current Cyborg series. In the past it has seemed aimless, and the latest issue is no exception. In many ways, it is a mere coda to last issue’s victory in the Digital Reality. 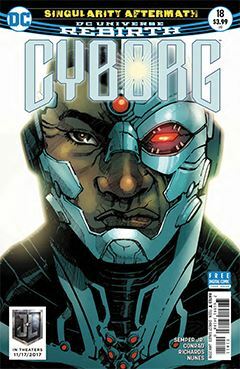 Cyborg says his good-byes and returns to the “real” world, along with Anomaly, who, after seeing a world inhabited by machines, now recognizes the error of his ways. Semper’s writing here is suspect, because rather than show the reader what has transpired, he uses Cyborg’s narration to tell the reader. Imagine how uninspired a movie might be if we listened to the director’s narration, rather than the actor’s reciting their lines. It’s a bold experiment by the writer, but it ultimately fails. This seems to be the end, as Victor Stone comes to terms with both his humanity and the technology with which he shares it. A fresh story arc – indeed, a Rebirth – is promised beginning next issue. But I can’t help wonder at the timing. The Justice League movie comes out in a few weeks, and I wonder if this wasn’t designed by DC Editorial to allow those who enjoy Cyborg on the big screen to jump on board the title right away. Perhaps Semper was asked to compress a bigger ending into a single issue. If so, DC did no one any favors; not the readers, not Semper, nor potentially new fans. Or perhaps, like me, DC has grown weary of Semper’s slow-paced writing style and is hoping for someone with a greater sense of drama and action to take over the title. We’ll find out next issue.